So far in this pregnancy, I’ve purchased very few maternity pieces (maybe a pair each of jeans, active pants, leggings) and have been getting by with stretchy or flowy regular clothes. ASOS maternity, however, has been tempting me with some of the cutest styles that I can actually see myself wearing well beyond pregnancy! They have dresses from casual (see their beach dress on me) to special occasion, so definitely take a look if you’re expecting and need a wedding guest or shower outfit. I’ve also been guilty of borrowing my friend’s ASOS maternity shorts when I wasn’t even pregnant, and finally picked myself up a pair (available in white, blue, or black denim)! I’m a sucker for a romantic floral dress, and this one did not disappoint in person. The only aspect that’s really making it “maternity” is the higher empire-style waist. So unlike maternity clothes with gathering or extra fabric around the belly area, this dress should look pretty normal worn post-pregnancy. The material is a medium to thicker weight scuba fabric, and I also love the partially-open back detailing (I’m wearing my usual Bristols 6 nippies covers). Fit-wise, ASOS usually runs 1 to 2 sizes smaller than U.S. brands. I also want to highlight this darling little circle bag (comes in primrose or black as well) from TDE. I first purchased a box bag from this brand and have reached for it SO much (see it styled on me here, here, here, here). It’s a great Mark Cross-style dupe for a fraction of the price, and I’ve found the durable, scratch-resistant saffiano leather to hold up nicely. Their box bag is a retro-inspired classic while the circle is more fresh and fun – both are a great smaller size for petite ladies and come with an adjustable shoulder strap! – If you want to dine there, book online as soon as you start planning your trip (you can always cancel later). When I looked in March, there was only a slot or two left for lunch in May with nothing available for dinner! – The lunch and dinner ambiance can be very different. We had lunch outdoors which was nice, but dinner indoors looks very romantic with 400 lit candles framing these picture-perfect windows shown above! – If you can’t get reservations and still want to stop by, we noticed people wandering in after 2:30PM (when the kitchen closes between lunch and dinner) and were served drinks on the dining patio. For drinks, the champagne bar (opens at 6PM) inside hotel Le Sirenuse is popular, but instead of that I’d recommend going 2 minutes down the street to their Franco’s Bar (opens at 5PM) for a more vibrant setting and equally nice views. It apparently gets pretty busy in nice weather, with people lining up ahead of time outside in order to snag tables with the best views! Drinks were priced about average for the area (14 Euro cocktails) and were served with a side of almonds and olives. You look gorgeous babe! I love the dreamy pictures and everything! Looking good, Jean! Love the maternity dress on you, it looks stunning! Sounds like you had a wonderful time as well! I’ve been following you for a couple of years, and I really appreciate your post on how to look older, as well as your experience with IVF. I’ve just recently graduated from college, and I do love fashion, clothes and makeup, but as a young woman, I used to sometimes get swept away into thinking that people have perfect lives, and you openly sharing your experiences and thoughts about life really helps me remember that life isn’t perfect. As I enter the career world, being a petite woman (only 149cm tall!) and who’s skinny, and fine-boned, I often find myself being intimidated by other adults, who are either bigger or taller than I am. Do you ever find yourself feeling that way? I find I can’t wear heels, because I have certain leg issue. How does one cope with looking small in a big world (especially for jobs that require people engagement such as teaching -when your students may tower over you)? While the tips to look older are definitely super helpful, sometimes I feel as if I have to dedicate so much of my time to build this image of me, that at many times, isn’t who really I am – yet because I am petite, I have to carefully build myself up so much more than others. It is frustrating and demoralizing at times, because it’s like I am trying to be someone I am not. I’m not sure if that makes sense. A penny for your thoughts? I’m 5 feet 0 inches and for the first couple of years of my working life I was a part-time teacher (I switched careers later). “Umm I’m sorry but how old are you?” was what students, parents, school administrators, and janitorial staff all felt compelled to ask once they realized I wasn’t a student. After graduate school I became a civil servant and I thought things would be different. I was wrong. People assumed I was an intern. After I got married and had two babies I expected things would finally change. I was again wrong. The other day a bubbly new junior staff asked me why I am dressed like a thirty-year-old and I replied “Sweetheart, I’m in my mid thirties but you made me feel five years younger so thanks!”. I guess what I’m trying to say is that the signals you can send to those around you with clothes and makeup have their limitations. Some people just can’t see beyond appearances and snap judgements. But you’ll eventually learn to enjoy the situation with good humor. So don’t loose yourself trying to present yourself in a way that isn’t really you. Focus on building your professional skills and dress however the hell you want to, not what they expect of you. Good luck! You’re beautiful, this dress fits you great! You look incredible Jean! Your dress looks amazing and I’ve loved your snaps from your trip so much! Loving these vacation posts and maternity wear suggestions. Please don’t be afraid to post more pregnancy related posts such as husband musings continued, registry wish lists, nursery decor, and how you and Nick are prepping for baby in general. Very excited to continue riding this pregnancy journey with you both! Aw thank you Vivian for the kind words! Time has flown by … we haven’t started looking at registry items yet and won’t have a nursery due to our very limited space, but it’ll be interesting and exciting trying to figure that all out! I usually think floral doesn’t work on adults but you make it look fresh and appealing every time – so glad you’re enjoying yourselves as a couple before the baby arrives! I hope your pregnancy continues to be uneventful and as comfortable as it can be. I love the cutout of the back of the dress. And the view of the mountains is so pretty. YOU ARE ADORABLE! That dress is so chic! Love how you accessorize. Fabulous! Looking forward to meeting you on the 9th at Bloomies! 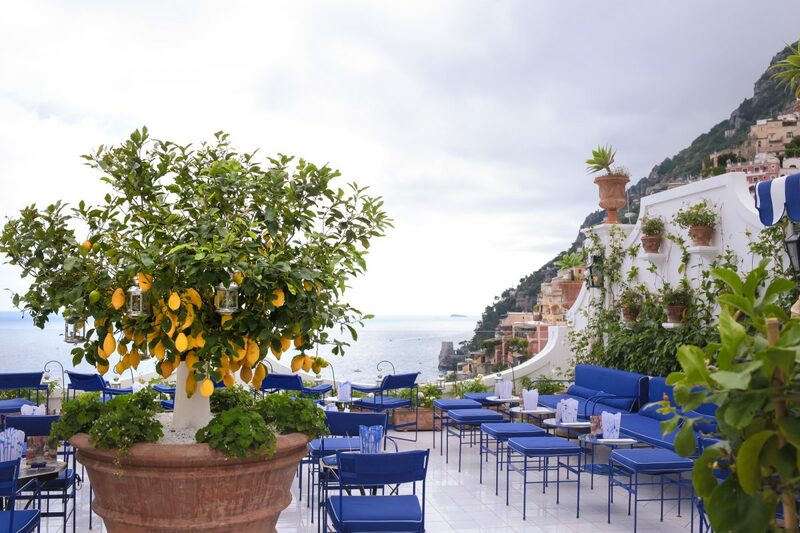 I’m loving all of your posts so far about the Amalfi Coast! <3 🙂 All of the scenery looks stunning! And the dress you're wearing also so pretty! You look amazing and all looks like a dream! This dress looks amazing! Love the style and the print. Of course, you also make it look beautiful and effortless. That color on the fountain is so beautiful. Love the contrasting blue chairs. Just very vibrant and eye catching. Such an amazing look on you! Also, beautiful pictures as always! your maternity style is so amazing!! I am loving these shots as they are making me wish I was traveling through Italy again! Gorgeous dress! Hey since you specialize in petites, I had an unfortunate experience with Loft today. A current summer top is on special for $22 – in regular and plus sizes. The petite size of the exact same item is $49.50! When I asked for the special pricing, they said it’s not on petites – crazy! This is discrimination. Have you run into this before? Hi, love your blog! I’ve been following for years! Anyway, random question, maybe you will see this maybe not. I’m going on a interview, wondering if a blue denim skirt is okay to wear if I dress it up with a nicer top and nice flats? It’s a button up a line skirt that comes at the knee. Medium indigo color. It’s just summer here and I’m pretty much a new grad going for an entry level position, so I’m not sure how formal I have to be. It is for a consulting firm though, not a huge established one, a smaller boutique one? Thanks!!!!!!!! If you get a chance to answer. If not, I love your blog anyway, super helpful tips. Hi Sylvia! I would not recommend wearing denim to an interview unless you know for sure that it’s a super casual dress environment (ie some tech companies where everyone wears jeans or even more casual attire). It’s always better safe than sorry with interviews, so maybe see if you have a solid navy pencil skirt to swap in instead of the denim skirt. For consulting firms I would usually recommend a full suit. Good luck !! I love all these beautiful outfits and gorgeous pictures! Thanks for sharing! These outfits are incredible! I love your blog! You look pretty and love all these beautiful outfits. I’m so happy to see you in your pregnancy as beautiful . I hope your pregnancy continues to be uneventful and as comfortable as it can be.